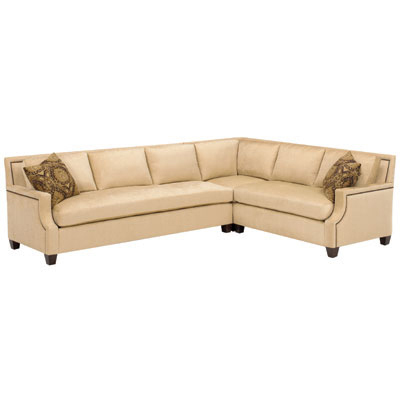 Overall Dimensions: Width: " Depth: 39" Height: 38 1/2"
Notes: Shown: 1010-31 LAF Sofa W88 Inside W82 1/2 with (1) 19" Pillow, 1010-22 RAF Loveseat W60 Inside W54 1/2 with (1) 19" Pillow, 1010-15 Corner Chair W39. Also Available 1010-21 LAF Loveseat, 1010-32 RAF Sofa. Shown with Optional 3/4" Aged Brass Nail Trim.